As indicated by the version number Bibble is a long time player in the RAW converter market. Recently the application experienced a series of major upgrades by integrating a number of third-party tools such as Noise Ninja, PerfectlyClear and a version of PTLens. Apart from the stand-alone application it also integrates (optionally) into Photoshop as a plug-in (replacing ACR in the process). BibbleLabs is quite keen to support new cameras ASAP making the overall package a pretty interesting offer. 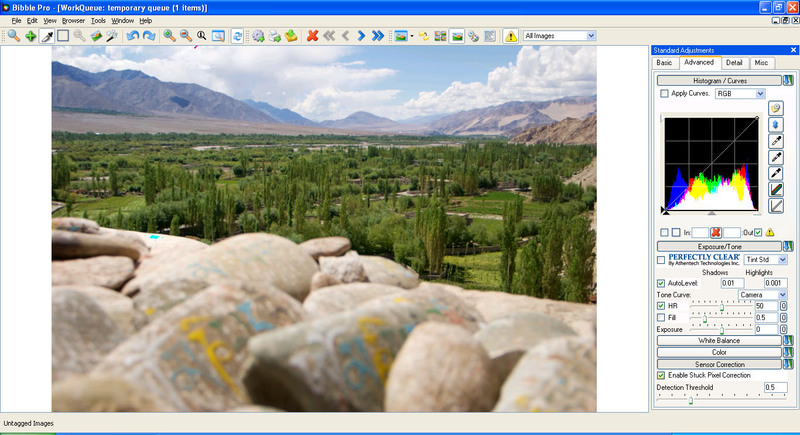 Similar to other products the (stand-alone) application is divided into an image browser and a development mode. The browser allows you to rate and filter images and to put them into a development queue where you can tune the individual images. All modifications applied to an image are stored in a .bib file so it is possible to perform various corrections at different times without loosing intermediate result steps. You can export the final results either on a per image basis or via a complete batch job. The final quality of the converted images is naturally dependent on the specific camera profile. Feature-wise the product is very advanced and generally Bibble has a couple of shiny aspects but it has its weaknesses. A major plus of the application is the integration of NoiseNinja - one of the best noise reduction tools out there. 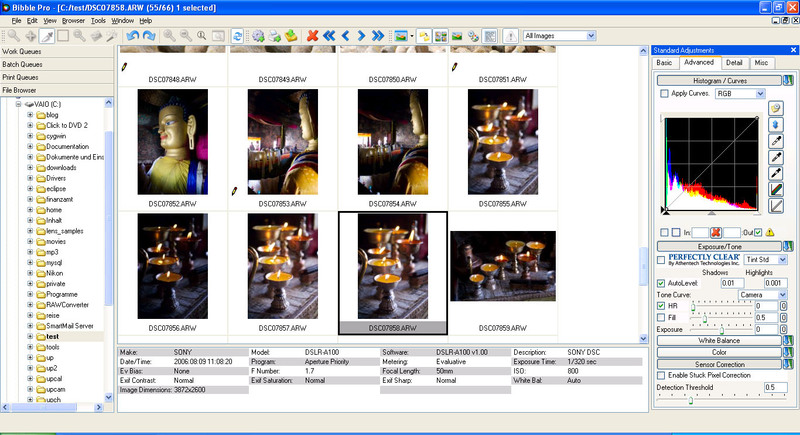 If you´re primarily dealing with high ISO files this aspect alone is worth to spend a deeper look into the application. Bibble comes with a "light" version of NoiseNinja which is already pretty good. If you prefer to have more control options of NoiseNinja you have to purchase an extra license. The resulting resolution after the RAW conversion is a bit disappointed and at the lower end of the analysed converters. The sharpening characteristic is also rather coarse thus looking somewhat artificial when taking a more aggressive approach. Sensor noise is comparatively moderate probably also thanks to the rather conservative sharpening. As mentioned above Bibble v4.9 has licensed/integrated "Perfectly Clear", an optionally active auto-all-correction tool. On the average Perfectly Clear does a pretty good job - at least with normal to high contrast images. I'd say that low contrast images tend to be over-corrected (result too contrasty). The tool also produces some sharpening artifacts (spot-like) in some situations (high ISO noise or within fine patterns). The standard sharpening should be strictly deactivated when using Perfectly Clear. Unfortunately it is not possible to disable or modify the behavior of individual correction aspects but it remains possible to add corrections on top though the correction via other controls is counter-corrected to some degree again. Beyond Perfectly Clear Bibble offers the usual auto-leveling which is, similar to other applications, not overly sophisticated. However, there're lots of manual correction options which perform nicely like highlight recovery, fill light and quite detailed color correction controls (inc. a useful color vibrancy control). Bibble also takes advantage of PTLens though they rely on an older open source variant of the tool. PTLens is capable to correct distortions based on lens-specific profiles (matched with the EXIF data of an image). Reads: a profile must exist - otherwise there's no distortion correction possible within Bibble. The list of profiles is pretty extensive for Canon and Nikon, less so for the others. You can perform lens calibrations according to a defined procedure and send the results to BibbleLabs to be added to the profile database in the next release. It remains to be seen whether this approach works out but I think it would be useful to be able to add profiles on the fly to the local application. Beyond the distortion aspects Bibble also offers manual CA and vignetting reduction as well as hot/dead pixel detection. When activating all correction aspects (specifically PTLens) Bibble has rather high requirements regarding the CPU power. Bibble Pro is a pretty complete and powerful product though not hassle-free. When taking advantage of all aspects you better got a pretty strong CPU or be prepared for some coffee-breaks. Once you are a bit familiar with the application the final result quality can be very good except maybe regarding sharpness which seems to require a some fine-tuning by BibbleLabs. Color tuning is quite convincing and lens flaws can be correctly pretty well although the distortion module may not work for everyone. A real highlight of the product is the integration of NoiseNinja, one of the leading noise reduction tools out there. The processing of noisy high ISO images works like a breeze here. Another good news is that Bibble Pro doesn't break your bank account.